PATEK PHILIPPE REF. 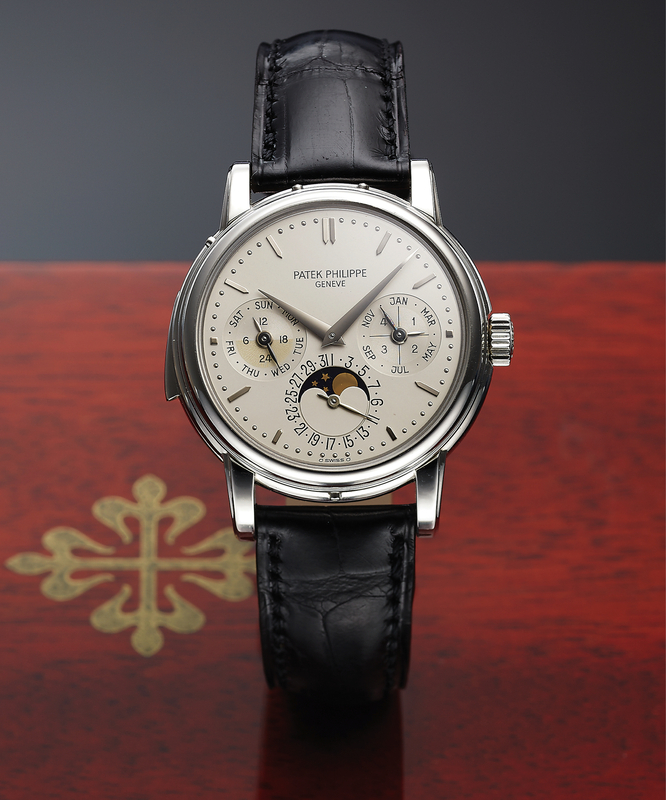 3974 MINUTE-REPEATING PERPETUAL CALENDAR PLATINUM Patek Philippe & Cie, Genève, No. 1906082, case No. 2854679, Ref. 3974 P. Made in 1992, sold March 18th, 1993. Extremely fine and rare, astronomic, minute repeating, self-winding, platinum wristwatch with perpetual calendar, leap year indication, moon phases and a platinum Patek Philippe buckle. Accompanied by a service box, the Extract of the Archives, correspondence from Patek Philippe and various booklets. Three body, solid, polished, stepped bezel, transparent case back, sapphire crystals. Silver with applied white gold baton indexes, outer dot minute divisions, subsidiary dials for the days of the month, of the week, the 24 hours indication (A.M. - P.M.), the months and the leap year, aperture for the moon phases. White gold dauphine hands. Cal. R 27 Q, stamped with the Seal of Geneva quality mark, rhodium plated, fausses cotes decoration, 39 jewels, straight-line lever escapement, Gyromax balance adjusted to heat, cold isochronism and 5 positions, shock absorber, self-compensating free-sprung flat balance spring, 22K gold micro-rotor. Repeating on gongs by activating slide on the band. Dial, case and movement signed. C. Three body, solid, polished, stepped bezel, transparent case back, sapphire crystals. D. Silver with applied white gold baton indexes, outer dot minute divisions, subsidiary dials for the days of the month, of the week, the 24 hours indication (A.M. - P.M.), the months and the leap year, aperture for the moon phases. White gold dauphine hands. M. Cal. R 27 Q, stamped with the Seal of Geneva quality mark, rhodium plated, fausses cotes decoration, 39 jewels, straight-line lever escapement, Gyromax balance adjusted to heat, cold isochronism and 5 positions, shock absorber, self-compensating free-sprung flat balance spring, 22K gold micro-rotor. Repeating on gongs by activating slide on the band. Dial, case and movement signed. DIAM. 36 mm. THICKNESS 12 mm.